Ledi Sayadaw was an influential Theravada Buddhist monk. 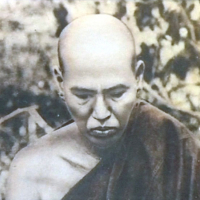 He was recognized from a young age as being developed in both the theory (Abhidharma) and practice of Buddhism and so was revered as being scholarly.Ledi Sayadaw was one of the foremost Burmese Buddhist figures of his age.He was instrumental in reviving the traditional practice of Vipassana, making it more available for renunciates and lay people alike.He wrote many books on Dhamma in Burmese, and these were accessible even to a serious layperson; hence he was responsible for spreading Dhamma to all levels of society and reviving the traditional practice of vipassana meditation, making it more available for renunciates and lay people alike. I want to post here! Becoming a contributor to this Portal allows you to post content here. Click “Apply” if you wish to contribute or else click “Cancel.” You will still be able to follow and stay updated with the activities on this Portal.